This post is sponsored by The Home Depot Foundation, but all opinions and love are my own. There is something really special about serving others. I had a chance, last week, to experience first hand the energy and spark of The Home Depot’s Celebration of Service movement. If you haven’t heard of The Home Depot’s Celebration of Service program, it is truly extraordinary. In just two months, between 9/11 and Veteran’s day they will have impacted more than 1,000 homes for veterans. They are completely committed to serving those who have served. It’s personal for them. It’s also personal for me. 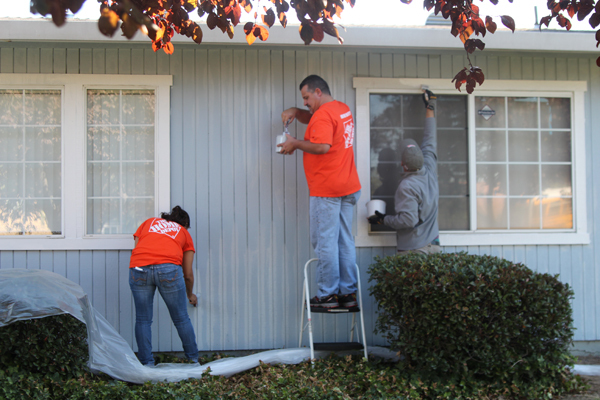 It was a total no brainer when The Home Depot contacted me and invited me to head up to Sacramento, California to be part of their local Celebration of Service project. When I arrived on site, I really had no idea what I was in for. 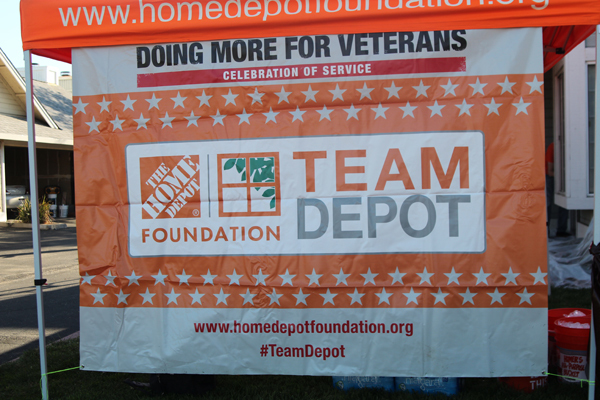 I had heard about The Home Depot Foundation and Celebration of Service but I had never witnessed a project first hand. The energy was so high. 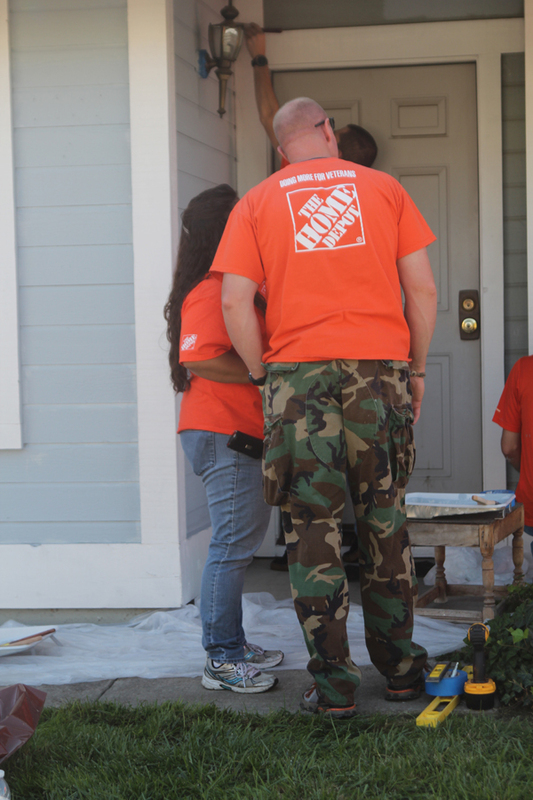 I learned quickly that all of the volunteers were The Home Depot employees, volunteering their time (some of them giving up their hours at work, or spending their only day off) to make life better for veterans. They picked up paint brushes with smiles on their faces and quickly got to work. Our project was in service of The Sacramento Veterans Resource Center’s women’s facility. 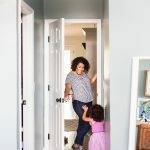 The Sacramento Veterans Resource Center supports veterans through services such as a housing program for women with children, employment training, skills counseling, as well as drug, alcohol and mental health treatment. In just one day the women’s facility’s exterior got a fresh coat of paint, security doors, and new window screens. It was such an honor to meet some of the residents of the facility. One of the women who really touched my heart, was Angie. An Air Force veteran who joined the Air Force just before 9/11, she is so proud of her service (as she should be!). After serving overseas in support of both Operation Iraqi Freedom and Operation Enduring Freedom, Angie came home, and like many war veterans felt lost and confused. After finishing her enlistment and getting out the military she realized much of how she was feeling was a result of PTSD. 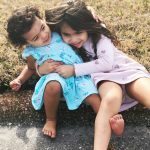 After struggling with alcohol and chronic homelessness she made the bold decision to leave everything behind and move across the country to Fort Drum, to live with her baby brother and his family. Her brother, Dennis was a solider. He enlisted after Angie, making the military a sort of family tradition. Soon after Angie got back on her feet her brother left for his first tour in Aghanistan. Her world crumbled when he was killed in action just two months later. She was the sole support system for his young wife. It wasn’t long after she moved back to California that she found herself struggling and once more, on the streets. After sifting through the support available for veterans, she finally found the help she needed at The Sacramento Veterans Resource Center. Because of her prior experiences and PTSD, being in a women only facility was extremely important to Angie. And the work Team Depot volunteers did to make the facility safer for these women, is even more valuable. The Home Depot hasn’t forgotten the sacrifices of Angie or her veteran comrades. They can’t forget. 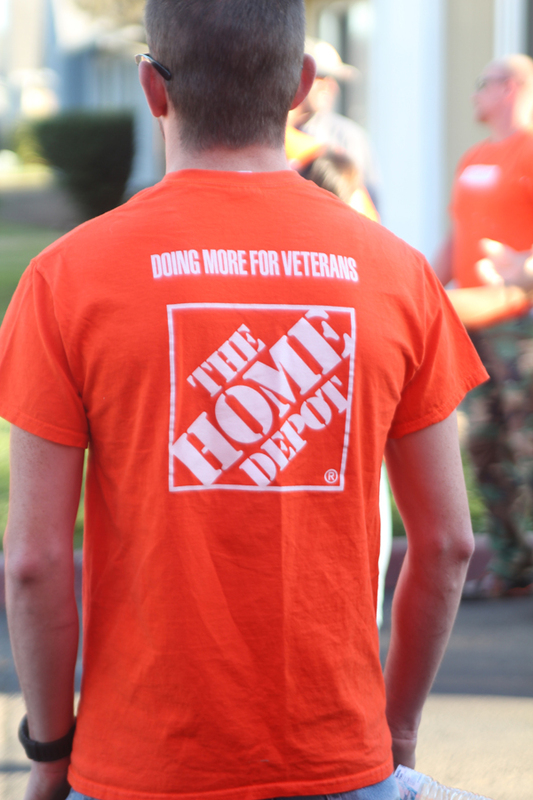 It’s personal for The Home Depot because they employ more than 35,000 veterans. 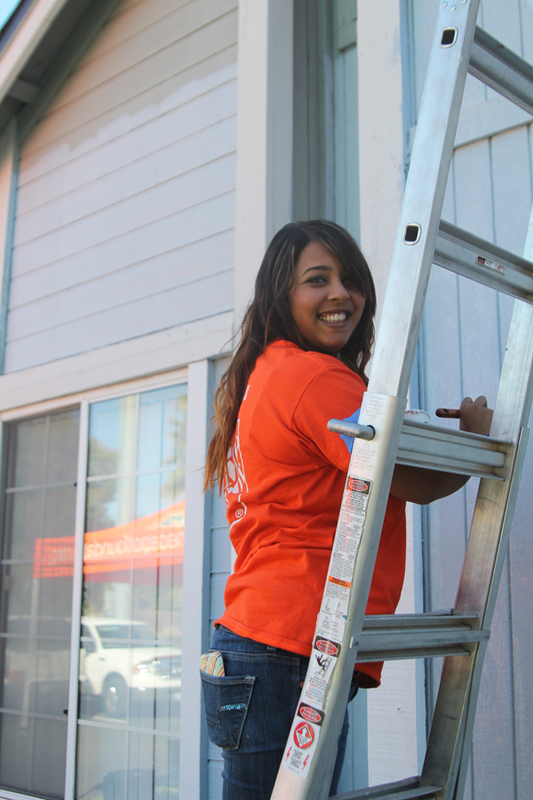 And their Army of Associates has transformed the homes of over 13,000 veterans! The dedication of The Home Depot and their associates is speaks volumes! It’s more than just work, it’s a passion for service. I wish you all could have been there to experience this with me. There are few things I love more in this life than our military and those who serve us, having the opportunity to take part in giving back was truly priceless. For more information on The Home Depot Foundation and the work they are doing visit their website or Facebook page. 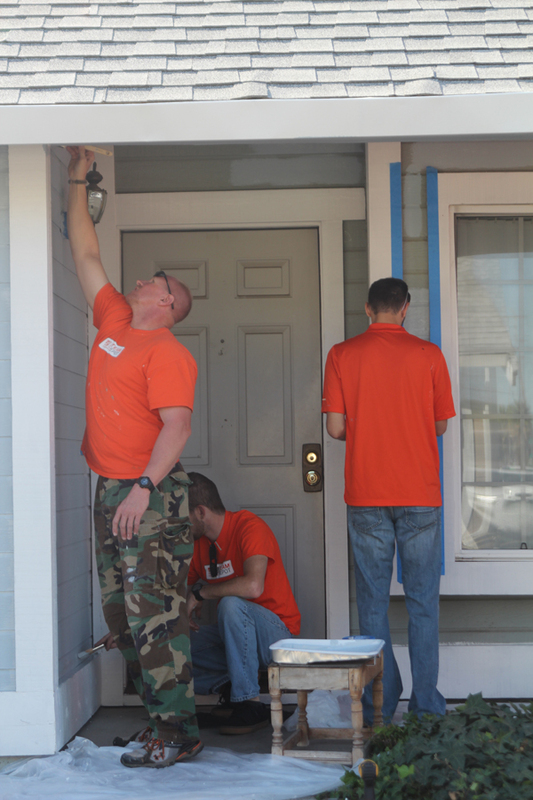 You can also view other Celebration of Service projects on the Team Depot site. 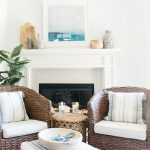 The Home Depot Foundation partnered with bloggers such as me for their Celebration of Service program. As part of this program, I received compensation for my time. 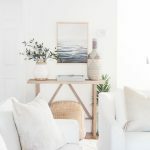 They did not tell me what to purchase or what to say about any product mentioned in these posts. 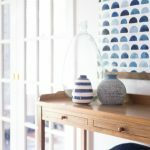 The Home Depot Foundation believes that consumers and bloggers are free to form their own opinions and share them in their own words. The Home Depot Foundation’s policies align with WOMMA Ethics Code, FTC guidelines and social media engagement recommendations. Awesome job, Chelsea! So inspiring! Wow! What an AMAZING program!!! How beautiful!! Thank YOU for your part in this, Chelsea! Great way to celebrate amazing service! Great program, and so inspiring! Glad you shared this experience!! Chelsea, it is so awesome that you participated in something like this! And what an amazing program in general! Absolutely wonderful, Chelsea! I’m so happy you were able to participate in this amazing program! Such a cool project! You are the perfect person to participate in this and to share the story! What an incredible thing to be a part of, Chelsea! And I love to see so many giving back, truly inspiring! This is an amazing program and a great story Chelsea so proud of you for taking a part in it. Thank you so much for your story. Angie is my daughter and Preston Dennis was my son. He was on his second tour when he gave his life for this country. Angie suffered soo much on her deployment after 9-11. and losing her baby brother was devastating. We are so proud of them both pain mixed with PRIDE. Thanks to ALL who gave their time and hearts to this program. Maria, what a pleasure to have you visiting my blog. I really, truly enjoyed meeting Angie and I am so happy to have been able to participate in this Celebration of Service for Angie and her peers. She’s a true gem. Warmest regards to all of you!